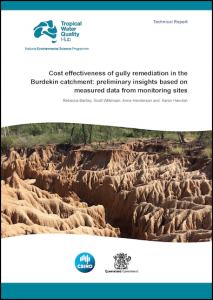 This project will evaluate the cost, effectiveness and biophysical processes of gully remediation options in the Burdekin Region. 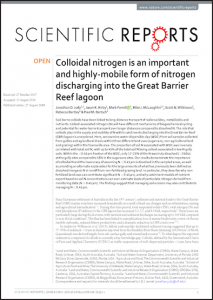 Sub-surface soil erosion is the major source of anthropogenic sediment delivered to the Great Barrier Reef and must be addressed to help meet Reef water quality targets. The Reef Trust Gully Erosion Control Programme is the first to focus on gully remediation. 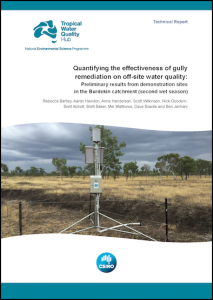 This study will evaluate and communicate the impact of gully remediation options to underpin future investor, stakeholder and public confidence in the impact of erosion control programmes on (i) water quality (ii) project cost-effectiveness and (iii) agricultural production. 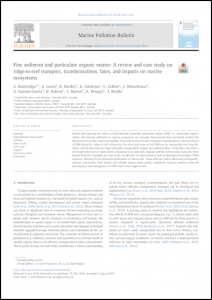 Researchers have made considerable progress into understanding the source areas and processes delivering sediment to the GBR (see references cited in Bartley et al, 2014 and Lewis et al, 2015). Gully erosion and bare ‘scalded’ areas on hillslopes have been identified as the dominant sediment sources delivering sediment to the GBR Lagoon. Conceptually, erosion can be controlled by controlling grazing pressure away from erosion features like gullies and scalds, and by setting stocking rates that maintain ground cover and forage to reduce surface runoff (Thorburn and Wilkinson, 2013; Thorburn et al, 2013; Wilkinson et al, 2015). 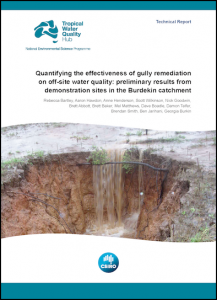 Gully remediation through revegetation has been trialled at one site in the Burdekin River basin (Wilkinson et al, 2013) and in the Normanby River basin (Shellberg and Brooks, 2013). Water quality improvement programmes have begun investing in these and other gully erosion control activities. The critical gap in our understanding is now the design and effectiveness of erosion remediation options for controlling the dominant sources of sediment from gullies at property and sub-catchment scale. To enable broader uptake of channel remediation across the GBR catchments and to demonstrate progress in sediment management to stakeholders and the public, we will investigate the benefit of these actions on (i) physical processes including runoff generation, hydraulic conditions, vegetation growth, sediment trapping, (ii) the amount of sediment leaving the treated area (iii) the cost-effectiveness of the treatment options and (iv) the influence of the treatment (including paddock subdivision and grazing management) on agricultural production at the paddock scale, and on grazier perceptions of their land management. 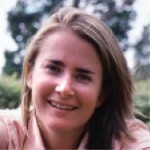 The project will test the perception that gully and scald management doesn’t offer a lot to the beef enterprise. The project will provide guidelines on the cost-effectiveness of various gully remediation options to allow better targeting on Reef Trust investment and broader investment in remediation. Such solid information is required to complement and extend monitoring within NRM programmes. The project will work with partners to help demonstrate the results of gully erosion control trials. 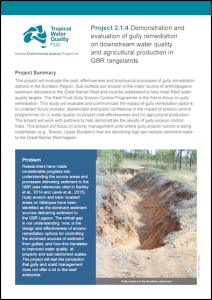 This project will focus on priority management units where gully erosion control is being undertaken (e.g., Bowen, Upper Burdekin) that are delivering high per-hectare sediment loads to the Great Barrier Reef lagoon. c) Develop/evaluate practical on-farm nutrient and sediment loss mitigation and capture and land management practices that will influence behavioural change and improve water quality outcomes – link to field trials. d) Develop/evaluate practical methods for ‘off farm’ nutrient and sediment loss mitigation and capture – link to field trials. Water quality; Sediment; Gully erosion; Grazing; Burdekin. 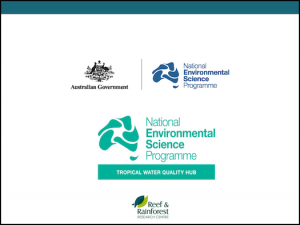 This project is jointly funded through CSIRO, QEHP, NQ Dry Tropics, QDAF, QDSITI and the Australian Government’s National Environmental Science Programme. Markers are not an exact position of where the research is taking place, they are only to be used as a guide to the general area in which it is being carried out.